Sometimes (actually quite often) I find crossover between what I’m doing on the firearms training front and the rest of my life. Vision training is one of those areas. 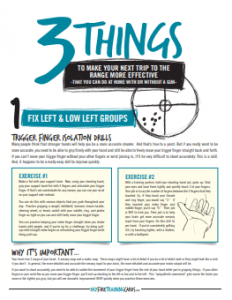 The same exercises that help me pick up my front sight faster also help me keep my eyes on the road more when I’m driving and help me scan a room/crowd faster. In this case, the drill is one of the drills from http://TacticalVisionTraining.com that I’ve adapted to do in my truck (without a pistol) at stoplights. It’s easy, quick, and INCREDIBLY powerful. You’re going to want to turn up the volume on this one. Like it? Please click the Share button above. Once you get in the habit of doing this drill, you’ll quickly notice that you’ll be watching the car ahead of you, flick your eyes to your speedometer and back and be shocked about how clear everything was and how quickly you were able to refocus both times. I use a metronome and have upregulated my visual cortex so that I have gone from being able to shift clear focus 30-60 times per minute (60 is average) to being able to shift clear focus 150-180 times per minute. One of the ways that this has played out is that I went from having a lag during my drawstroke while my vision caught up to having my eyes already focused on the point in space where my front sight was going to be, before it got there. In addition, when you are seeing quicker, it’s much easier to follow your sights through recoil and make quicker followup shots. When you get back to the range, it might actually take you a little bit to get to where your timing catches up with your newfound visual speed. A lot of instructors and top shooters will tell you that you need to follow your sights during recoil, but don’t tell you how to actually do it. Vision training is the key and this drill is one of the quickest and easiest things you can do. Like I said, this drill is one of the drills from my Tactical Vision Training Course. I started doing vision training almost 20 years ago and got very serious about it 5 or so years ago because of work I did with Dr. Eric Cobb. Since vision is arguably 80% of the shooting equation, the work that I’ve done on vision has had a dramatic impact on my ability to shoot at a high level while sending minimal rounds downrange. Questions? Comments? Fire away by asking below. I do some light lifting every other morning and one of the exercises I do is to hold out an 8 or 15 pound dumbbell straight out from my body like it is a pistol (one-handed) for 30 seconds each side (or 15 seconds if it is the 15 pound). While I do that, I have that Seconds Pro timer on my iPhone beeping each second. I hold the dumbbell steady so that the top is aligned with something across the room (actually pretty far across in an adjoining room) and I shift focus back and forth on the beats. I’ve now gotten to where I’m comfortable shifting focus back and forth 2 times per beat (120 times/minute) for the first set on each side. I can sometimes keep up shifting my focus 4 times per second but can only do that for about 4 to 8 seconds and I wear out and have to go back to 2 times per second. It’s a great combo in your workout no matter what style you do. You are also practicing aligning something close and far and holding it steady while being a little heavier than your pistol. Great exercise for keeping your eye muscles sharp and ready for fast focus as we get older. It’s one of those drills that helps people MORE the older they are. That beast is a 2011 F-350. It’s been a great truck so far. Very cool every-day application Ox, I’ll definitely try that. I’ve been doing similar vision drills while out in nature as well. Walk head-up, focus as deep and far into the woods as possible, instantly bring focus back in to near-by objects (trees, rocks etc), repeat. These drills have translated very well to my shooting (target to front-sight focus).